David Clayton, Crucifixion, six feet tall, egg tempera on panel, 2010. Thomas More College of Liberal Arts in Merrimack, NH has recently commissioned David Clayton, the College’s Artist-in-Residence, to complete a six foot painted crucifix for its chapel. Mr. Clayton describes the piece: "It is low so that when the priest holds the host aloft, the figure of Christ is clearly visible within the angle of vision. We have Mass both ad orientem and versus populum, so the intention here is to make sure that however the Mass is said, the focus is not on the personality of the priest but on the person of Christ. "The cross itself is based upon the early gothic Franciscan crosses. The style is similar to that iconographic, except that the face, in the Franciscan manner, reveals his suffering. The geometric designs in the background include an octagonal motif that represents the 'eighth day' of creation, that is, the age of the life, death and resurrection of Our Lord. There is a six-winged seraph at Our Lord's feet. 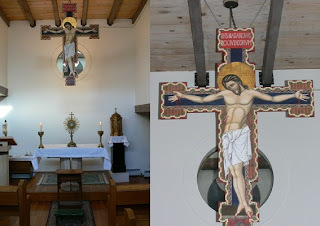 "The height of cross creates a vertical dimension in a small chapel by drawing the eye up to space above the sanctuary that was hardly noticed before because it was unused. Aside from seeking to steadily introduce more art, the next step is to raise money for a new altar and a gothic-style reredos that will go against the back wall and allow for the central placement of the tabernacle." In Christian art, the pelican represents Christ’s ultimate sacrifice on the Cross for our redemption. 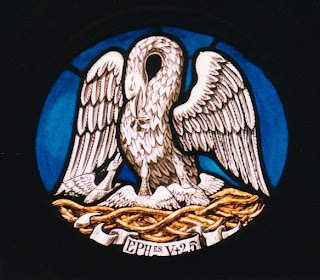 This traditional attribution stems from the belief that a female pelican will strike her breast with her beak, drawing blood to feed her young. Like the pelican, Christ shed His blood on the Cross for our redemption, and Christ offers Himself to us in the sacrifice of the Eucharist to nourish and strengthen us spiritually. As we draw near to the celebration of Christ’s death on the Cross on Good Friday, let us ask the “Pelican of Mercy” to nourish and strengthen us through His sacrifice. Does the Church need artistic beauty in her liturgy? What occurs when pastors and catechists disregard the tradition of sacred art in their ministry? What role can Christian art play in recapturing the imagination of Christians and in redirecting our culture towards the pursuit of truth, goodness and beauty? These are some of the questions Dr. Jem Sullivan tackles in her work The Beauty of Faith: Using Christian Art to Spread the Good News, recently published by Our Sunday Visitor. Framing her discussion within the context of our society's sensory overload - in which mainstream "iconography" becomes more prevalent precisely as Christian images become scarce - she emphasizes the power of images to convey ideas and to shape culture. Dr. Sullivan calls for a recovery of art's traditional role in the life of the Church, arguing that it will enable us to encounter, teach, and live our faith in a more profound and engaged way. To purchase the book, please click here. Thomas More College's Way of Beauty Atelier is offering a unique series of summer programs in Catholic art and inspiration that are taught by internationally renowned working Catholic artists. Artists and aspiring artists can choose from one or more of three programs in iconography, naturalistic drawing, and the principles of Catholic art. His Holiness Pope Benedict XVI has articulated that our modern age is "marked...by a weakening of hope...[by] increasing signs of resignation, aggression and despair." Yet by rendering an authentic beauty - one which brings us face to face with the Source of all beauty - artists can become "heralds and witnesses of hope for humanity" (Address to Artists, 2009). At The Foundation for Sacred Arts, our aim to is advance the Holy Father's ideals in a concrete way by supporting the production of inspiring new works of sacred art, architecture and music that exist as "an authentic expression of the human genius and a reflection of divine beauty." We are thus especially pleased that our mission has merited the esteem the Holy Father himself, who recently wrote to us imparting his Apostolic Blessing, expressing that he trusts that "[our] work will help, in the words of the late Pope John Paul II, 'to affirm that true beauty which, as a glimmer of the Spirit of God, will transfigure matter, opening the human heart to the sense of the eternal.'" As our Lord affirmed, "man does not live by bread alone" (Matthew 4:4). Please continue to pray that by providing opportunities for others to encounter Divine Beauty in the sacred arts, the Foundation will help feed the spiritual hunger of humanity.